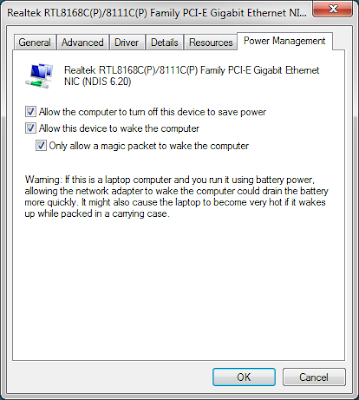 2) In Windows 7, I double clicked my adapter in Device Manager and on the resulting window, clicked the Power Management tab. In this tab, select each check box (and as long as you have “Only allow a magic packet to wake the computer“, you should be good). 3) In that same adapter window, select the Advanced tab. 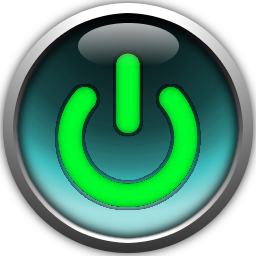 Look for “Shutdown Wake-On-Lan“, “Wake on Magic Packet“, and “Wake on pattern match“. Make sure all of them are enabled. Something extra I did (which I recommend): For my NIC, I have two things called “Energy Efficient Ethernet” and “Green Ethernet” which were enabled. Doing some searching, Green Ethernet actually can slow down your connection and since both of them basically do the same thing, I disabled both. 4) Now sending a magic packet to the device’s MAC address should yield it waking up from sleep!! This should work for a completely shut down system too!